Itching to cut off your hair? Try one of these updated versions of classic crops. Itching to cut off your hair? Try one of these updated versions of classic crops as seen on Emma Roberts, Jennifer Lawrence, and Jennifer Hudson. 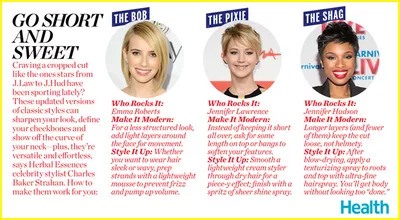 Celebrity hairstylist Charles Baker Strahan says they'll define your cheekbones and sharpen your entire look.